iKON Celebration for Their Sold Out Meat -The long waiting iKON TV will be released soon. iKON members are hard working for iKON TV shooting. Recently, they were doing part time job. They took part time job in child care and TV home shopping. 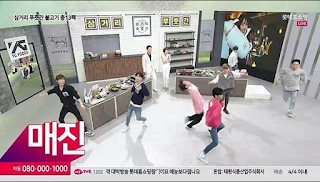 In the TV home shopping they sell meet, while showing their eating broadcast in YG restaurant, Samgoeri Butchers. 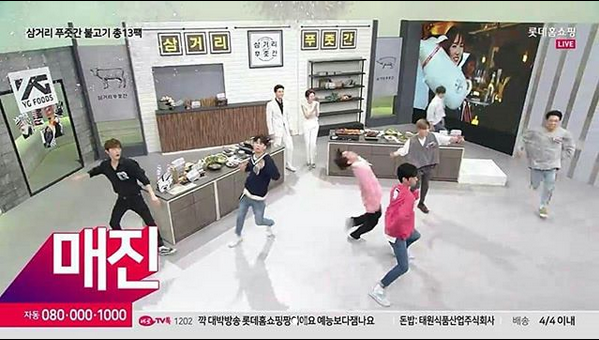 They were eating meat, while Yunhyoeng and B.I showing their cooking ability. In the home shopping they were also sell meet. And they were doing celebration for their sold out meet. Also Read : iKON Filming for iKON TV? Another part time job was doing by Bobby, Yunhyoung and Donghyuk who working in Kids Cafe. They were entertain the children who comes to the cafe. They were dancing together and spending happy time together with the kids. Meanwhile June and Chanwoo worked in Aori Ramen, and becoming freindly waiters.